Today is International Tabletop Day! This day is designed to help people be more aware of tabletop gaming! Since Star Wars has a large presence in the gaming world, I thought this would be a perfect day to feature a couple of my favorite Star Wars tabletop games! These games are perfect for Star Wars fans as well as gamers and would be a perfect way to spend International Tabletop day 2015! Let's start with what is my absolute favorite Star Wars tabletop game, Star Wars Miniatures. 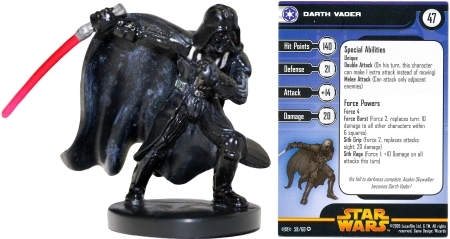 The Star Wars Miniatures game was produced from Wizards of the Coast between the years 2004 and 2010. This game involves little pieces that each come with a corresponding stat card. This stat card includes that characters Special Abilities, Commander Effects, Force Powers and regular stats (Hit Points, Defense, Attack and Damage). Each miniature piece has a cost which indicates how "good" the piece is. The higher the cost, the better the piece. The players agree on point value for the game. The more points, the longer the game is. The most common point values for a game are 150 or 200 points. Using each pieces cost, both players assemble a force in which to use against their opponent. There are a few restrictions when building a force. One restriction is that your force can only contain one of each unique. A unique is a named character such as Han Solo. You may only use one Han Solo on your force. Another restriction is that your pieces must all be from the same faction (unless otherwise stated on the stat card). The factions include: Old Republic, Republic, Rebels, New Republic, Mandalorians, Sith, Separatists, Empire, Yuzzhan Vong and Fringe. Fringe pieces may be used on any force. Once you have your force made, you set your pieces up on a map. Each map is different and the maps are made to resemble some of our favorite planets and locations in the Star Wars Universe. Some of the maps include, Tatooine, Mustafar, Death Star, Hoth, Endor, Coruscant, Bespin, Christophsis and more. The objective of the game is to destroy your opponents force. Without going into too much detail about the rules of the game, luck and strategy are both involved (which makes this game great). Pieces in this game range from well-known characters from the movies to characters from the Star Wars books, video games, comic books, the Clone Wars animated series and more. The game is different every time you play it. With the die rolls always changing, the maps changing and the forces switching in every game, the experience is constantly changing and you'll never have the exact same experience twice! Unfortunately, Wizards of the Coast is no longer producing new pieces. There are some places that may still carry some pieces such as gaming/comic book stores, but going online never fails if interested in purchasing some of the figures or starter sets. Some fans may be more interested in the space battles of Star Wars. If that's the case, Star Wars: X-Wing from Fantasy Flight is for you! This game is still currently producing new pieces and is very popular among Star Wars fans and gamers! Similar to the Star Wars Miniatures game, players assemble their force using the printed cost on the bottom of the ships corresponding stat card. The objective of this game is the same as the Star Wars Miniatures game; you must destroy your opponent's force! This game is played on gaming mats which have intricate space designs on them. If your ship accidentally flies off the map, the ship is destroyed. The Star Wars: X-Wing game only involves ships, but you can have different pilots to pilot each ship. Generally, if you have a pilot like Luke Skywalker flying an X-Wing, he will be more beneficial than a generic Red Squadron Pilot. Gaming experiences are always changing in this game as well! The game comes with asteroids which can be added to the mat to make navigating your ships more challenging. What are the odds of that?! Each stat card contains the ship's Pilot Skill Value, Primary Weapon Value, Agility Value, Hull Value and Shield Value. In order to make the game more interesting, players have the option to add upgrades to their ships (depending on what the ship will allow as an upgrade). Upgrades include better weapons, droids, pilots and more. Factions in this game include: Rebels, Empire and Scum and Villainy. At this time, players cannot play as characters or ships from the prequel trilogy or the Clone Wars. Characters from the EU are included in Star Wars: X-Wing. Enjoy this year's International Tabletop day with the Force!